Call me Pocahontas but this is an idea that Feng Shui By Fishgirl loves! Imagine it tucked in the woods where The Last of the Mohicans is on his way back to you…or maybe it’s in your backyard and your little wild ones are playing in it happily for hours (instead of watching TV they’re in their teepee). Adding this to my To Do List today! I dreamed this! This actual thing being created! I dreamed about it last month and wrote on my blog about it! Two lovers made this structure then turned into horses and fled. 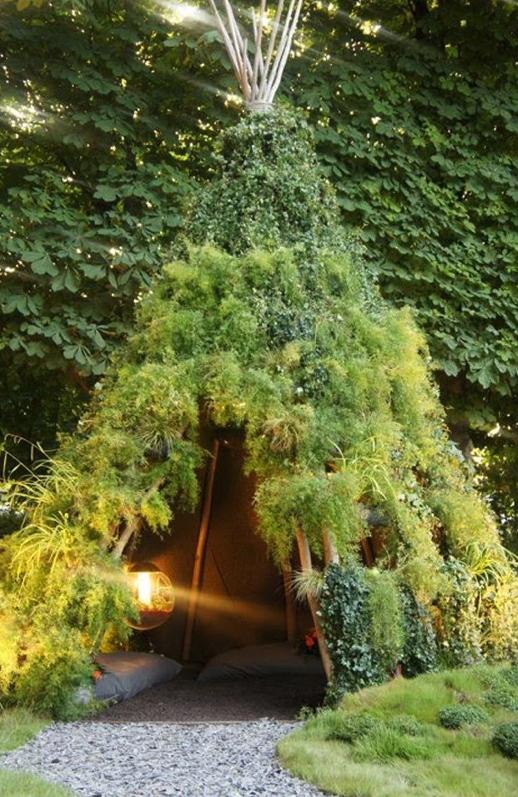 Do you think that having a teepee structure is good feng shui considering it is pointed and could represent poison arrows? The roof is pointed to the sky representing yang masculine energy directed to the heavens. The interior forms a round shape (yin, feminine) which offsets and balances the yin yang. Yes, I approve teepees for good feng shui. Thanks for a very interesting question!